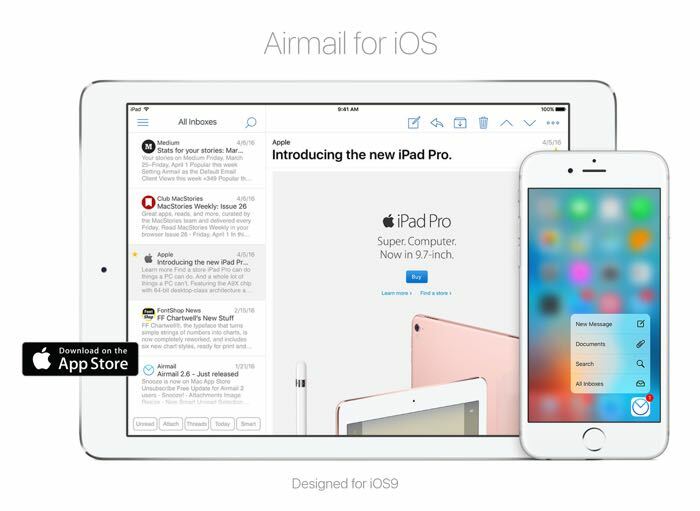 Airmail has been a popular email app among Mac users for some time, the app launched on Apple’s iPhone back in February and now the company has made the app compatible with Apple’s iPad. The latest version of Airmail for iOS now supports the iPad and it also supports split screen and multitasking on the iPad. Designed for the latest generation iPhone and iOS9, it supports 3D Touch, fast document previewing, high quality pdf creation, and native integration with other apps and services for a frictionless workflow. Workflow customisation at the core with a rich features set like snooze, interactive push notification, and full inbox sync. iCloud sync provide a full ubiquitous sync experience so that all your mailbox preferences, and app preferences are synced. The update also brings a range of new features to the iPhone and it has been optimized for the latest Apple device and also devices running iOS 9 and above. You can find out more details about the latest version of Airmail for the iPhone and iPad over at the company’s website at the link below.